Pterosaurs are widely considered to be so different from all other reptiles that (according to the traditional hypothesis) no other taxa come close to them. But is this just the product of taxonomic exclusion? Have we even considered other candidates? Given this professional shrug of the shoulders as a starting point, our goal will be to find three or four taxa that document an increasing number of pterosaurian traits. These traits might include wings, but they don’t have to. Recently Dr. Sterling Nesbitt (2011) recovered a family tree in which pterosaurs nested at the base of a branch that included Lagerpeton and Dinosauriformes as sisters. Together these taxa comprised a clade named the Ornithodira (Gauthier 1986; = Avemetatarsalia, Benton 1999), which nested as a sister to the Ornithosuchidae and both were derived from the more basal Phytosauria, Euparkeria and the Proterochampsidae in order of greater distance (Fig. 1). In essence, Nesbitt (2011) recovered the traditional archosaur tree. He elected to exclude Scleromochlus from his analysis despite the fact that several earlier studies (Sereno 1991, Bennett 1996) nested the little reptile as the closest sister to pterosaurs. Scleromochlus had a wide flat skull with a deep antorbital fossa, extremely small hands and no fifth toe, traits that should disqualify it from a close relationship with pterosaurs. A larger study nests Scleromochlus as a sister to the basal crocodyloform, Gracilisuchus. 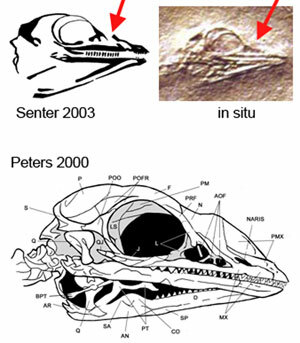 Nesbitt (2011) also ignored the fenestrasaurs of Peters (2000, see below), which represent the opposing candidate lineage. Fig. 1. These are the taxa that Nesbitt (2011) reports are sisters to the pterosaur Dimorphodon. When you put reconstructions of Nesbitt’s taxa together into an evolutionary sequence (Fig. 1), there appears to be something very wrong in the sequence. It doesn’t provide what we are looking for, “an increasing number of pterosaurian traits.” Nor does it appear to work the way evolution typically does, in small steps. There really isn’t much to tie these taxa together and plenty of absent and vestigial digits to immediately remove all of them from any consideration as pterosaur sister candidates. Characters used by Nesbitt 2011 to link pterosaurs to these taxa are discussed in the upcoming part 2 of this report. By the way, Bakker (1986) considered pterosaurs to be dinosaurs…not dinosaur cousins, but dinosaurs themselves. That’s an hypothesis that is even tougher to support. Figure 2. A new series of taxa documenting a gradual accumulation of pterosaur traits. These are lepidosauriforms then tritosaurs then fenestrasaurs, then pterosaurs. The ‘heretical’ fenestrasaur hypothesis. Over ten years ago Peters (2000) presented four taxa, Langobardisaurus, Cosesaurus, Sharovipteryx and Longisquama that documented an increasing number of pterosaurian traits. In cladistic analysis, the three fenestrasaurs (plus Langobardisaurus) consistently nested closer to pterosaurs than any other included taxon. Reconstructions of these taxa, along with the basal lizard, Huehuecuetzpalli, Macrocnemus and Jesairosaurus, are provided to demonstrate the evolutionary continuity of this sequence and to make the lizard connection more apparent. Not only are these taxa the right size (each one could sit on your hand), as they get closer and closer to pterosaurs they document “an increasing number of pterosaurian traits.” Some of these characters are found elsewhere within the Reptilia (like cusped teeth), but other traits cannot be found anywhere else except in pterosaurs (full list upcoming in part 3). The fenestrasaurs, true to their name, had an antorbital fenestra, but without a fossa, convergent with that seen in archosauriforms. Cosesaurus had a pteroid (Peters 2009), a pterosaur-style sternal complex and prepubes, all documented here. I invite you to learn more about the lineage preceding pterosaurs by starting here with Huehuecuetzpalli. If you want to go all the way back to the beginning of reptiles to see a more complete lineage, click here. Why are fenestrasaurs not included in other cladistic analyses seeking to determine the origin of the pterosaurs or in those that happen to include pterosaurs? Well twice they were…sort of. Otherwise in the last eleven years these taxa have been mocked, suppressed and ignored. The reasons why filter through the following. Fig. 3. Red arrow points to the antorbital fenestra without a fossa in Cosesaurus. among a dozen other errors. Read more about these problems here and in the upcoming part 2 of this report. Fig. 4. 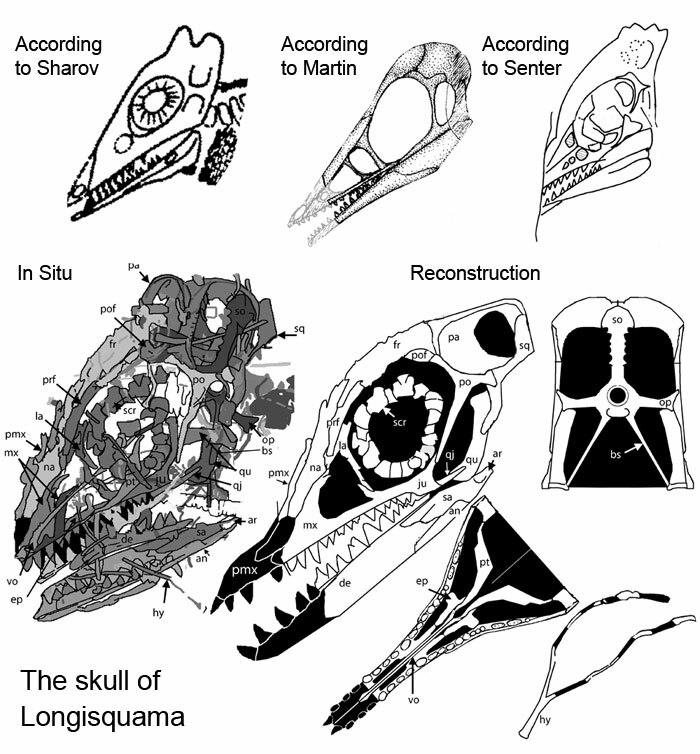 A short history of Longisquama skull tracings. All workers have traced an antorbital fenestra, but Senter (2003) reported it was not present. Note the level of detail provided by the DGS method in the lower tracing. 2. Arguing against Peters (2000), Hone et al. (2009) reported, “Moreover, the suggestion of a close relationship between pterosaurs and prolacertiforms such as Cosesaurus is contradicted by a considerable weight of opposing evidence.” Oddly, their so-called ‘evidence’ consisted of six pre-2000 cladistic analyses in which Cosesaurus was not included as a tested taxon and only one supertree analysis (Hone and Benton 2008) in which only a quarter of its characters were scored—and that data were lifted from Evans (1988) who borrowed from Sanz and Lopez-Martinez (1984) who obviously gave Cosesaurus only a cursory glance as demonstrated by their cartoonish reconstruction (Fig. 5.) Supertree testing means you don’t have to look at the specimens themselves, only at the data of others. Figure 5. Cosesaurus illustrated as a juvenile Macrocnemus by Sanz and Lopez-Martinez (1984). Hone et al. (2009) reminded readers that Hone and Benton (2007) criticized Peters (2000b) on methodological grounds, which, ad hominem, conveniently permitted them to sidestep three quarters of the traits of Cosesaurus and completely avoid consideration of the other pterosaur sister taxa proposed by Peters (2000b), Sharovipteryx and Longisquama. In essence, Hone and Benton (2007, 2008) decided to test whether pterosaurs nested closer to a series of prolacertiforms [fenestrasaurs] or to archosauriforms by eliminating and excluding the fenestrasaurs! That’s no test. That’s a rigged experiment. A one-party election. Why would they undo their own test? And then why would they trumpet their vague and, by their own admission (see above), inconclusive results? Further damning their results, Hone and Benton (2008) nested members of the Choristodera outside of the Choristoderes (separated by lepidosaurs). They also recovered lepidosaurs outside of the Lepidosauromorpha. Beyond all logic, Hone and Benton (2008) nested Cosesaurus as a sister to Proterosuchus (Fig. 6). Fig. 6. Hone and Benton recovered Cosesaurus as a sister to Proterosuchus, which, on the face of it, appears unlikely. Hone and Benton (2007, 2008) arrived at their supertree conclusions because the one matrix that included pterosaurs (Bennett 1996), was the only one they employed. By eliminating the fenestrasaur candidates, there was no test! It was all smoke and mirrors. Finally, for reasons only they know, Hone and Benton (2008) did not reference Peters (2000). Rather the Peters prolacertiform/fenestrasaur hypothesis that they had spent two consecutive papers (2007, 2008) “testing,” was falsely credited to Bennett (1996) after it was correctly credited in their 2007 paper. This is just a snapshot of the efforts paleontologists have been going through to avoid detailed examination of the basal fenestrasaurs and avoid including them in analyses that also include pterosaurs. Part two of this report will examine character lists from Senter (2003) and Nesbitt (2011) that include pterosaurs. Part three will examine the series of taxa in figure two that lead to pterosaurs while documenting the gradually increasing number of pterosaurian traits found there. Evidence and support in the form of nexus, pdf and jpeg files will be sent to all who request additional data. More info and references can be reviewed here. Confusion regarding the term “prolacertiform” with regard to pterosaurs stems from the fact that much larger, more inclusive recent studies after Peters (2000) recovered trees in which Prolacerta nested with the Archosauriformes while pterosaurs nested elsewhere on the tree, with the Fenestrasauria among the Squamates in a third clade, called the Tritosauria, or “third lizards,” documented here and here. Bakker RT 1986. The Dinosaur Heresies. New Theories Unlocking the Mystery of the Dinosaurs and Their Extinction. Zebra Books, 481 pp. Benton MJ 1999. Scleromochlus taylori and the origin of dinosaurs and pterosaurs. Philosophical Transactions of the Royal Society of London Series B Biological Sciences 354: 1423–1446. Evans SE 1988. The early history and relationships of the Diapsida. Pp. 221–260 in: Benton, M. J. (ed.) The Phylogeny and Classification of the Tetrapods, Volume 1: Amphibians, Reptiles, Birds. Syst Assoc Sp Vol No. 35A. Clarendon Press, Oxford. Gauthier JA 1986. Saurischian monophyly and the origin of birds. Memoirs of the California Academy of Science 8: 1–55. Hone DWE and Benton MJ 2008. Contrasting supertree and total-evidence methods: the origin of the pterosaurs. In: Hone DWE, Buffetaut E, editors. Flugsaurier: pterosaur papers in honour of Peter Wellnhofer. Vol. 28. Munich: Zittel B. p. 35–60. Hone DWE, Sullivan C and Bennett SC 2009. Interpreting the autopodia of tetrapods: interphalangeal lines hinge on too many assumptions. Hist Biol, iFirst article, 2009, 1–11, doi: 10.1080/08912960903154503. Peters D 2000. A reexamination of four prolacertiforms with implications for pterosaur phylogenesis. Rivista Italiana di Paleontologia e Stratigrafia 106: 293–336. Sanz, JL and López-Martinez N 1984. The prolacertid lepidosaurian Cosesaurus aviceps Ellenberger & Villalta, a claimed ‘protoavian’ from the Middle Triassic of Spain. Geobios 17:747–753. Sereno PC 1991. Basal archosaurs: phylogenetic relationships and functional implications. Journal of Vertebrate Paleontology 10 (supplement to 3): 1–53.